Greedo, the beady-eyed, green-skinned alien bounty hunter may have been killed by Han Solo – because Han shot first – but his memory will live on… and not just in reruns of Star Wars: A New Hope. 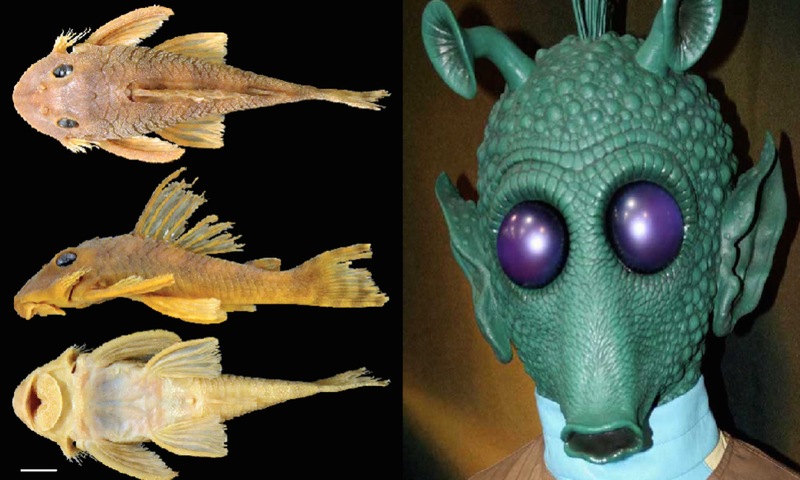 A new species of Brazillian catfish bearing distinctive Greedo-esque features such as a protruding, puckered mouth and thick facial bristles inspired Jonathan Armbruster, a biologist and lifetime Star Wars fan, to name the new species after the bounty hunter. Introducing: Peckoltia greedoi or Greedo fish. See the similarities? The specimens were originally found in 1998 but were identified as a different species, Peckoltia vittati. However, closer inspection by Armbruster and colleagues David Werneke, Milton Tan and Chris Hamilton, discovered significant differences between the 1998 catfish specimens and Peckoltia vittati. As a result, Star Wars fans everywhere have a living memorial to Greedo…. even if Han Solo shot first. Sources: Peckoltia greedoi at Auburn University and CNN.